Join Theresa Beffa as she interviews David Siteman Garland on "Entrepreneurship Education for Young Entrepreneurs." Entrepreneur and marketer David Siteman Garland is the Founder of The Rise To The Top, The #1 Non-Boring Resource For Building Your Business Smarter, Faster, Cheaper. 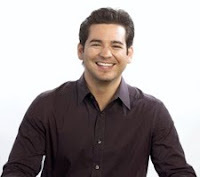 He writes/hosts RISE, a daily online web show for entrepreneurs and marketers, and The Rise To The Top TV show on ABC. After starting and stopping three small companies, (What 3 companies??) David became frustrated that he could not find a great resource to learn more about marketing his own businesses. What was missing was a new kind of TV show, one that was entertaining and educational, and that was part of an online hub that resonated with forward-thinking entrepreneurs and marketers. The audience would be those looking to start or grow their business by tapping into the wacky and wondrous world of innovative online and digital marketing. Since such a show and website didn't exist, David decided to build it himself by investing all of his savings, time and energy to create from scratch a TV show, online resource and community of entrepreneurs and marketers. David is a professional speaker and holds workshops for Fortune 500 Companies, brands, marketers and entrepreneurs looking to become interactive, social and more profitable. He has been featured on CNN, ABC, NBC, CBS, City TV, My Network Television, as well as on KMOX and in Alive Magazine, The Riverfront Times, Ladue News, and St. Louis Magazine. He has no idea why he has become a media magnet so early in his career, but he’s certainly not turning down interviews and requests for videos. Some of the clients David has worked with include: Entrepreneur's Organization, On The Run Mobil, AT&T, Pepsi America, Barnes Jewish Hospital, Paule, Camazine and Blumenthal, P.C., Yellow-Tie International, UPS, Washington University School Of Medicine, P.C., Ameren UE, The St. Louis Aces, Life Strategies, St. Louis University, Streetscape Magazine, eWomenNetwork, Fontbonne University, National Speakers Association, GO! Network St. Louis, The Alvin J. Siteman Cancer Center, Sub Zero Vodka Bar, Abstrakt Art Gallery, Widget Realm, UHY Advisors, US Bank, BancorpSouth, Indochino, Johnny Londoff Chevrolet and St. Louis Sourcelink. David also devotes his time to working with non-profits organizations including Junior Achievement and Lift For Life, an innovative charter school and program for youth, where he is a board member.. He also has guest lectured at Washington University in St. Louis, St. Louis University and Fontbonne University. David's website is at TheRisetotheTop.com. Looking forward to it, Steve!